Thrift Stores Don't Want Your Holey Socks. Here's Where To Recycle Your Rags. GreenZone wants to recycle your holey socks, and re-sell your gently worn clothes too. A bag of textiles ready for recycling. Rebecca Martinez reports on a new program in the city of Durham to encourage textile recycling. So you've unpacked your winter clothes and are packing up your warm weather duds to hibernate until spring. But what about all the leftover clothes? Not the gently worn items that might fetch a couple bucks at a consignment store -- go ahead and sell or donate those. We're talking about the real leftovers: Holey socks. Stained T-shirts. Stretched out underwear. What are you supposed to do with all that stuff? Let's say you're in Durham. Maybe you'd think the Scrap Exchange might want it. After all, they're a thrift store and creative reuse center. Think again. Marketing Director Diana Shark said they appreciate all resellable items, but, she said, the Scrap Exchange does not need bags of stained, worn clothing and sheets. "If it's something that, um, is in bad repair I would say not to donate it to us, and not to donate it to any thrift store because the manpower to process that textile is a net-zero gain, and if you can find another use for it in your own home, that would be great." Shark suggested re-using these socks and undershirts as cleaning rags. Don't need any more of those? 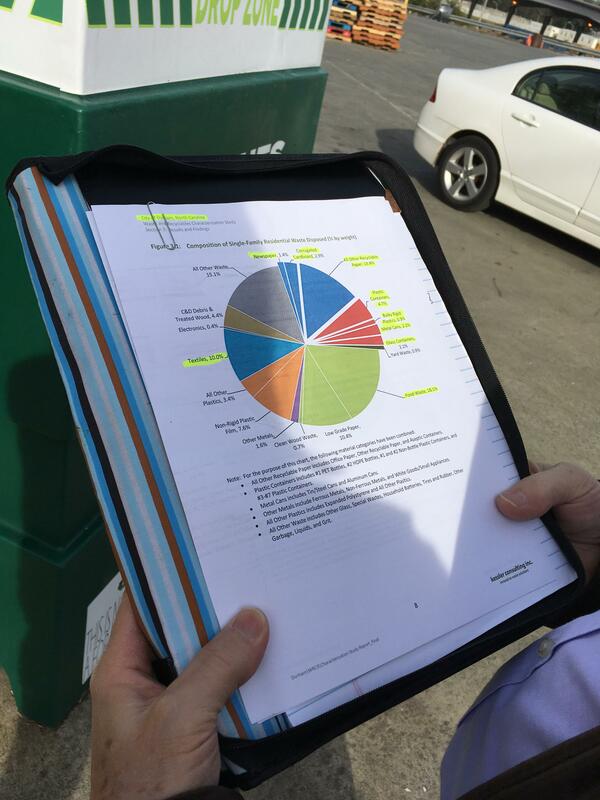 Durham Assistant Solid Waste Director Wayne Fenton displays a graph of the types of trash in Durham's waste stream. Textiles make up 10 percent of the items shipped to the landfill. You might be tempted to toss your textiles in the trash. Durham Assistant Solid Waste Director Wayne Fenton hopes you'll reconsider. Old clothes, sheets and other textiles make up about 10 percent of the garbage Durham collects from residents' homes and businesses, and then has to ship it to a landfill 100 miles away. Lots of North Carolina communities are in the same boat. Then, what do you do? Recycling is becoming an increasingly available option. Raleigh has offered textile recycling for months. But it's a new option in Durham, and it's still pretty limited. The city has a contract with a company called Green Zone. The for-profit recycler has set up a Drop Zone collection bin at the Waste Disposal and Recycling Center on East Club Boulevard. Durham County also has some textile collection bins. Grade A items are re-sold second hand. Grade B fabrics become industrial wiping cloths. Grade C textiles are turned into fibers to make new textiles. Ward said it was entirely appropriate to dump a bag of holey socks and stained bedding into the Drop Zone bin any time the Durham Waste Disposal and Recycling Center is open. Clarification: An earlier version of this story said Green Zone collects shoes and textiles and sorts them into grades. The company re-sells items as lots, which are graded based on the materials, but it doesn't have an actual sorting facility. Some North Carolina bars and restaurants are are phasing out the use of plastic straws because drinking straws are not recyclable and often make their way to the ocean, where they can injure marine life. You mean well, and want to help the environment. But have you ever tossed a plastic bag in your blue curbside recycling bin? Or a styrofoam container? You might be part of the reason America has such a lousy reputation for recycling. A massive amount of plastic is ending up in our oceans. It’s a global challenge that could be solved only with a huge, coordinated effort. North Carolinians are doing their part both by adding to, and lightening the load. North Carolina, like the rest of the world, has a plastic problem. And with more than 3,000 miles of ocean and sound coastline, the plastic that is dropped along a roadside or blown into in a ditch has a direct route to the sea.